When I was young, my father and I started to watch all the movies that we could. This included the ones we already owned and the ones that we felt we needed to watch. The ones we did not own required a quick trip to the local book store like Borders or Barnes & Noble. Before we knew it we had quite the collection. My two favorite categories were the WWII movies and the Clint Eastwood movies, only a few which overlapped. I first saw Kelly’s Heroes (1970). That was about when I was in 3rd grade. 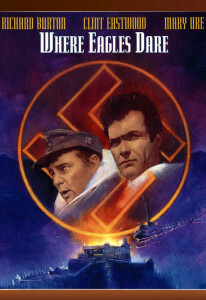 A short while later I watched another, Where Eagles Dare (1968). From its opening music, the movie immediately captivated me. Here are my thoughts on Where Eagles Dare. The film starts with a classic militaristic drum beat that gets you standing at attention. As you soar high above the Alps, a loud brass section kicks in, reminding me of the majestic parade march from Ben-Hur (1959). The entire opening score is reminiscent of the Tchaikovsky’s 1812 Overture, which got me on the edge of my seat waiting for the inevitable thunderous bang of the cannons. The greatness ends right after the opening credits. Rather than the expected fusillade of explosions, we have to hear the boring back story. But, hey, it’s a British movie. An American film would have featured non-stop action to get you hooked. Here is the short version of the boring back story; many British commandos are sitting in on a mission debriefing, the group is lead by Major John Smith, who is played by Richard Burton. At this time he was the most famous actor in the film and received the top-billing. There is one in the group who is American, Army Ranger Lieutenant Morris Schaffer, who is played by Clint Eastwood. The mission is to rescue an American General George Carnaby and return back to England. General Carnaby is located in Bavaria far behind enemy lines, so the team must parachute in from a disguised plane. One of my favorite scenes occurs after the team had landed. Smith and Schaffer stop at a supply depot to get whatever ammo and explosives they can find. A Nazi Patrol becomes suspicious and investigates the depot, but the two escape out the back window, leaving several little surprises for the patrol. [Spoiler Alert] There is a huge explosion and, fulfilling the promise of the opening theme, every nearby car and build explode as well. After some scouting of the area, we learn the the Nazis are holding the general in Hohenwerfen Castle. It’s a place only eagles dare to go. Schaffer is the explosive technician and on the way to the castle and while in the castle he lines everything with explosives. I don’t want to tell too much of the story, but there will be many explosions inside and outside of the castle, a suspenseful cable car scene, and a chase scene including a bus with a snowplow attached to it. I think if you enjoy a ton of explosions then you will enjoy these scenes too. Although, this isn’t the first movie most people would say if asked to name a Clint Eastwood movie, this is still an important movie to watch. Despite Clint Eastwood‘s reputation for violence in other films, his character kills more people in this film than any other Eastwood character. Also, it is one of the few times he is the sidekick in a movie. Not to mention, famed director, Steven Spielberg, voted this as his top war movie, mainly due to its sheer “boys own” factor of unreality. I think any war move fan will enjoy this movie, though if you are into action, adventure, or maybe even mystery, then you should check this movie out. Hope you enjoy, comment below with your thoughts, and don’t forget to follow us on Twitter and like us on Facebook. Whenever I made my Birthday Wish List it wasn’t uncommon for it to be made up of 75% movies. I would ask for both new and classic movies, but in 8th grade I got one of those movies I had never heard of. I got the Robocop Trilogy and to be honest at first glance I wasn’t thrilled about it mostly because, that year, I really wanted the Plant of the Apes Movie Collection instead. After reading the description on the back of the box and watching the trailer I figured out it was similar to all the other 1980’s Science-Fiction films I loved. It wasn’t long before I had watch each of the three movies in their entirely. Here are my thoughts on the first movie in the trilogy: Robocop. Like I said I had never heard of the movie, so I didn’t really know what to expect. 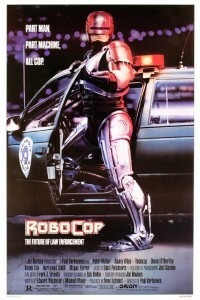 Robocop begins with an average cop joining the average police force to battle the criminals of Detroit, though he doesn’t know what he is getting himself into. The biggest criminal is Clarence J. Boddicker, played by Kurtwood Smith, who will always be Red Foreman from That ’70s Show (1998-2006 ) in my mind. We learn quickly that in the future the Detroit Police Department has been bought out by Omni Consumer Products (OCP), a big corporation getting their hands on everything from the military weaponry to hospitals. At this time the company is trying to replace the cops who are constantly going on strike. ED-209 is a prototype robot that will be the replacement. In a demonstration to the Board of Directors the robot malfunctions in a simple arrest and ends with ED-209 shooting the guts out of a poor employee. When I mean shooting his guts out I mean literally, this is one of those scenes you will never forget. The malfunction of ED-209 leads to the go ahead for the Robocop Project. Alex Murphy the cop we meet in the beginning will become Robocop, but I let you watch this movie to figure out how this comes to be. Robocop/Alex Murphy is played by Peter Weller, who I first saw in The Adventures of Buckaroo Banzai Across the 8th Dimension (1984). One of his first arrests is at a gas station and this is when Robocop will first repeat his famous line, “Dead or Alive you’re coming with me.” If you could guess from the fact that this is a 1980’s action movie or the fact that they are at a gas station, in the end there will be quite an explosion. We get a sense of what Hollywood thought the future would be like, including the misfire of Ronald Reagan’s Star Wars Project and a look at future boards games. We first heard of “Nukem” in a short commercial during the local evening news. It is a family board game from the Butler Brothers, simulating the inevitability of nuclear war all from the comfort of your own living room. Over the course of the game you can invade your opponents’ countries, impose sanctions and enforce regime change. The game ends when one of the players gives up and launches nukes. This causes a mushroom cloud hologram to erupt on your table at once showing both the creativity and the humor of this movie. This movie is important to watch for a few reasons. For starters if you’re going to see Robocop (2014), the remake, coming out February 12th, then you got to see the original. Also, if you are like me and love 1980’s action, adventure or if you just watch to see some classic ’80s haircuts, then you have to watch this. If you’ve seen Robocop (1987) then comment below on what your thoughts are and if you haven’t seen it, go watch, and then comment. Don’t forget to follow us on Twitter and like us on Facebook.